Frida Giannini brought a soft flirtatiousness to Gucci for its spring 2013 collection. Taking cues from the 1970s, tunic suits, loose trousers and caftans were the core ingredients in this collection. Silhouettes were Japanese-inspired with billowing ruffles and bell sleeves. Giannini said she was inspired by the portraits shot by photographers Richard Avedon and Gian Paolo Barbieri. The color story included salmon, cobalt blue, crisp white and yellow. Styling throughout the show was minimal however, necklines were decorated with brightly colored, chunky necklaces. The few printed items were vivid, over-sized patterns on simple styles. 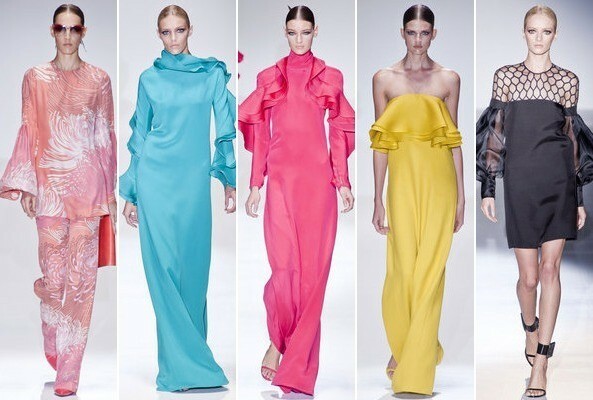 This was a collection about living in vivid color and comfort with an air of easy elegance. A certain gracefulness to each piece as the models strutted down the runway with ruffles floating. Overall Gucci's spring had a consistent theme. It didn't have a wide variety of design elements but rather, a strong sense of a few ideas. A sense of ease, it was all about the sleeve, ruffle and clean lines. Trousers were fluid yet lean, dresses feminine and simple while the suits were classy with a leisure inspired feel. It was an illustration of a bright and breezy lifestyle.